SMN Report: Hasegawa's blurb writer goes on to say, “Either side would have loved to have the Eurofighter Typhoon in 1940. 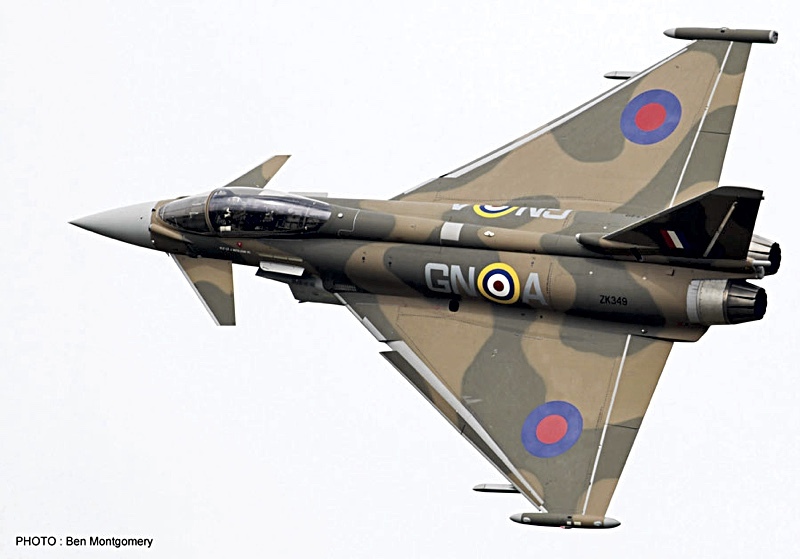 For the 75th anniversary of the Battle of Britain, the Royal Air Force 29th squadron decorated their Typhoon with a Spitfire camouflage scheme. And it’s those special markings that are the raison d’etre of this kit, flagged out as a Limited Edition that you can pre-order by September 3. The Typhoon (to our eyes) isn’t exactly a handsome beast (then again, neither was the Tornado, also a Euro-venture) but it is an important example of current fighter design, so belongs in any collection of modern combat aircraft. The Hasegawa kit has 195 components, and is a decent build with no particular assembly problems. With the 75th Anniversary markings, it looks absolutely great to our eyes, not least because it is visually far more interesting than the standard pale-grey applied to operational machines. The decal option in the box represents the Royal Air Force No 29 Squadron, ‘Battle of Britain 75th Anniversary’ Special Marking scheme. RAF code GN-A (ZK349) 2015. If you don’t have time or interest in assembling the Hasegawa kit, then the 1:72 scale Corgi Toys ready-built (below) could be for you. You’ll have to wait longer though, as the 2000-strong Special Edition is not due for release until December 15, 2015. The usual caveats with ready-builts vs plastic kits are there, the metal model having somewhat heavier detailing and panel lines than those incised in finely moulded plastic. Then again you don’t have to assemble a ready-built, so take your choice. The Corgi Typhoon has plenty of features, including assorted weapons, acceptably detailed pilot, and landing gear that can be positioned optionally up or down. 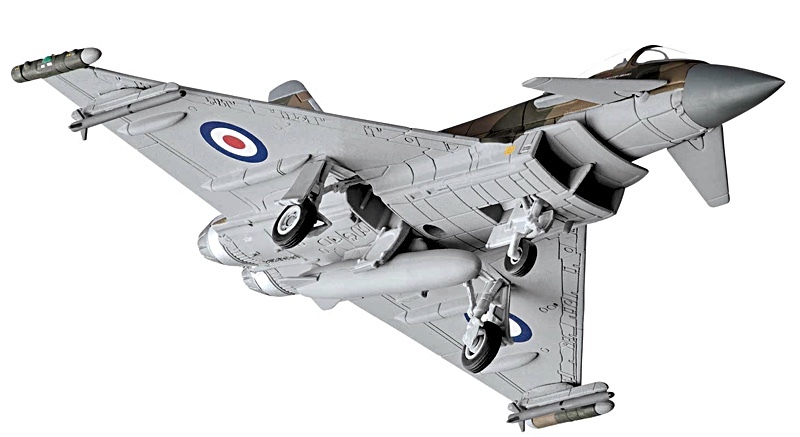 The model has a wingspan of 153 mm (6.02 in) and will be presented in Corgi’s usual high quality boxing. 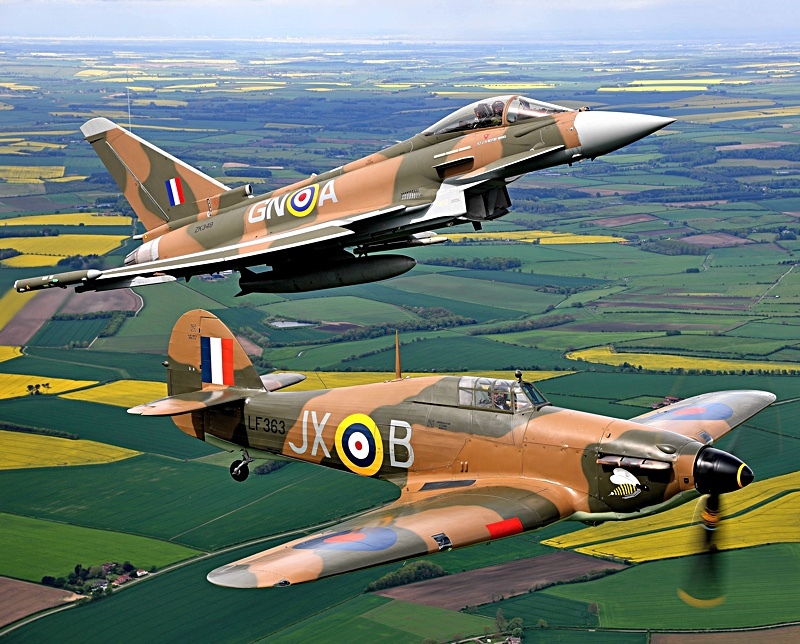 Corgi offers plenty of background information on the 75th Anniversary Typhoon, offering a model based on the following history: “As the UK marks the 75th Anniversary of the Battle of Britain during the summer of 2015, the Royal Air Force has commemorated this important event in Britain’s history by presenting one of its current front-line aircraft in the paint scheme of a Hawker Hurricane flown during the Battle. 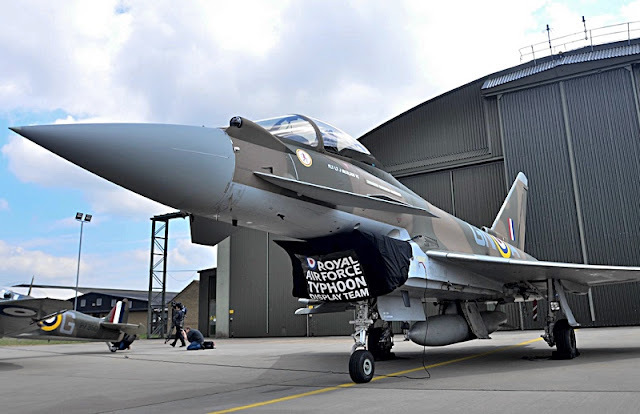 “Eurofighter Typhoon FGR.4 (ZK349) of 29(R) Squadron, based at RAF Coningsby, is making a very distinctive tribute to the only Fighter Command pilot to be awarded the Victoria Cross, during the Battle of Britain - Flt. Lt. Eric James Brindley Nicolson. 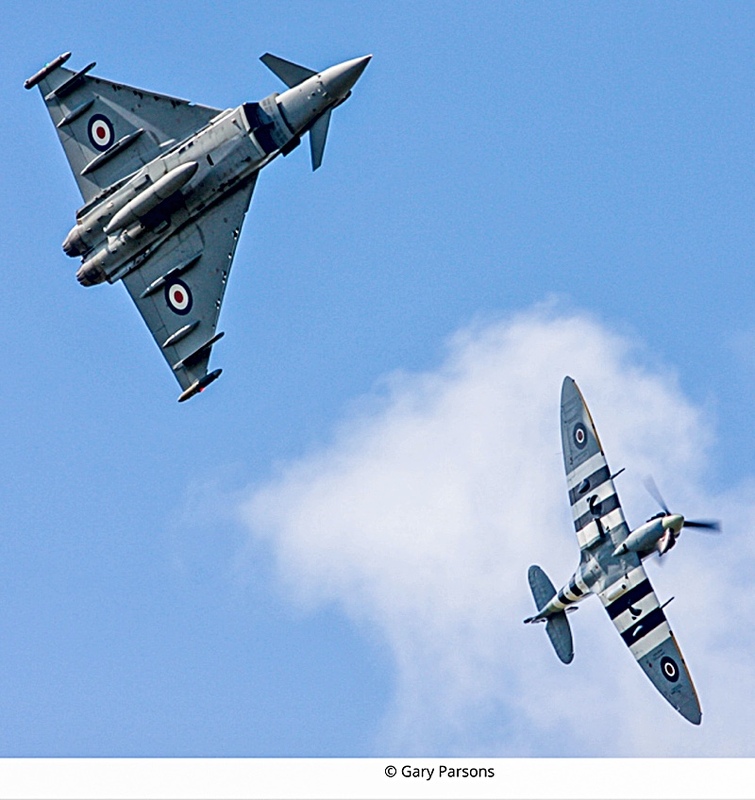 Typhoon and Hurricane (below) formate for a photo-shoot - lucky photographer! 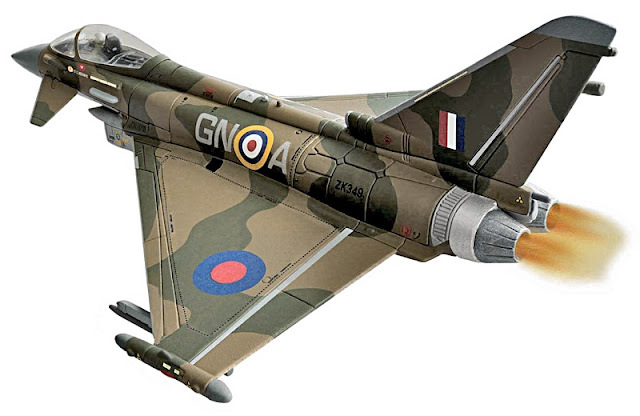 “Typhoon ZK349 has been painted in the colours of Flt. Lt. Nicolson’s 249 Squadron Hawker Hurricane Mk.I GN-A (P3576), which was involved in combat with Messerschmitt Bf 110s of the Luftwaffe over Southampton, on 16th August 1940. The specially-painted Typhoon has also been seen with the other famed Battle of Britain fighter, the Supekrmarine Spitfire (below) seen in this pic in later D-Day stripes, as painted in 1944. Quite a subject then, and the 1:72 scale Typhoon model - in metal or plastic - should make a good addition to a modern jet collection, and even better if presented parked next to a same-scale Hurricane.